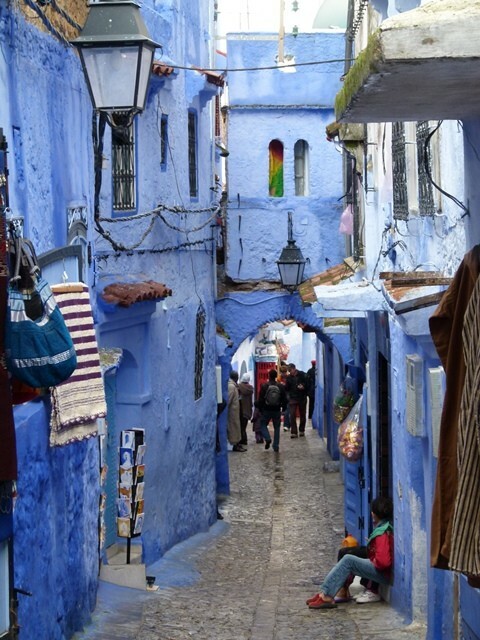 Pretty Chefchaouen is known as the “blue town” for good reason. 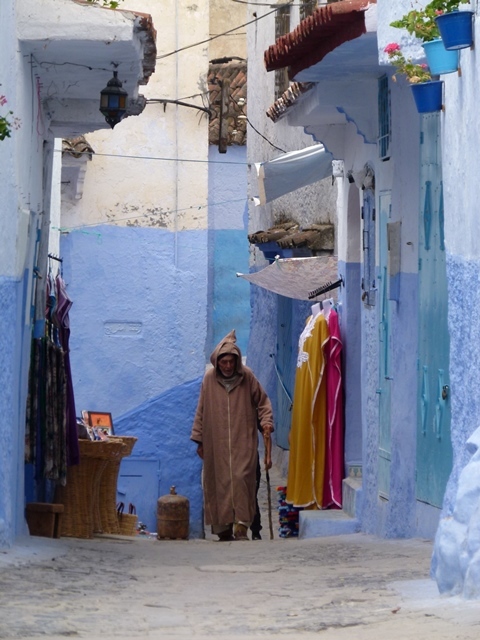 Just about every building in the old medina is painted blue – houses, shops bakeries and cafes alike. Some are painted a lovely icy blue others are more of a powder blue hue. The beautiful blue colouring of the town combined with Chefchaouen’s scenic location high up on a steep mountainside in the Rif Mountains, contribute to the wonderful allure of Chefchaouen. Indeed, the incredible history and culture of the Rif Mountain area is reason alone to include a visit to this beautiful mountain region of Morocco in your Berber Treasures Morocco Tours itinerary. Chefchaouen wonderfully preserves and nurtures its authentic Moroccan character and nature. 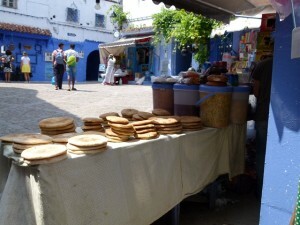 Chefchaouen’s main square, Plaza Outa el Hammam, is the vibrant centre of the town. There is always lots of activity happening and lots to see here: the imposing old Kasbah, colourful shops, local folk coming and going, family homes, and local plaza side cafes, which are popular with locals and visitors alike, provide a great spot to sit with a delicious mint tea, watch the local goings on and enjoy the attractive surrounds. 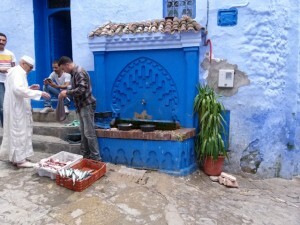 Chefchaouen is unquestionable worth including in your Morocco tours itinerary. 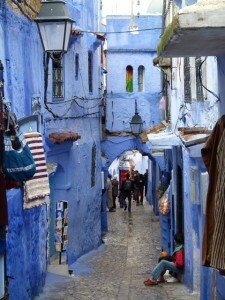 Chefchaouen is situated in the north of Morocco, and only about 90 minutes or so from Tangier. But if you do only allow the time to drive directly to Chefchaouen you will miss out on everything in between, including, for example, UNESCO world heritage Tetouan and the beautiful Mediterranean coastline – on clear days you can Spain and Gibraltar – more about that in a later post. 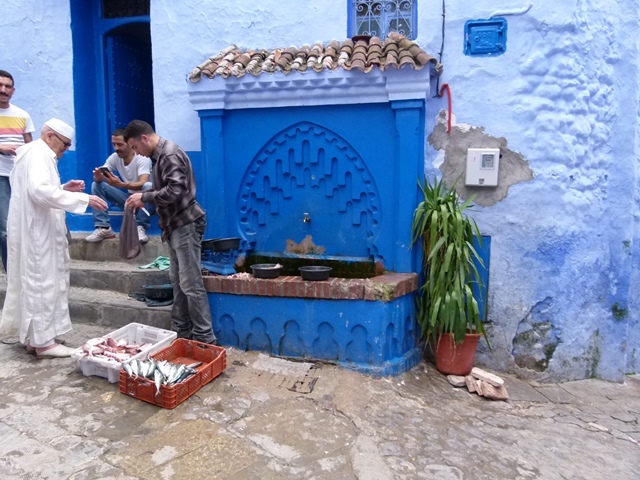 If you are interested in including a visit to Chefchaouen in your Berber Treasures Morocco Tours itinerary keep in mind that it is a long, long way from wonderful Marrakesh, Morocco’s fabulous Sahara Desert area (eg Erg Chebbi, Merzouga and Ait Benhaddou) and charming Essaouira. Like every Morocco travel decision it comes down to a question of how much time you have for your Morocco tours itinerary and prioritising your Morocco must sees and want to sees – hard decisions when you want to see it all, do it all, experience it all. Many of our Berber Treasures Morocco tours small group tours of Morocco include Chefchaouen (CE2, CE9, CE11/CE11R, CE12/CE12R) and of course if you choose to take one of our custom designed private tours of Morocco – your bespoke Morocco tours itinerary can most definitely include Chefchaouen. Email or call us now to discuss how best to include Chefchaouen in your Berber Treasures Morocco Tours itinerary. Morocco Travel: When is the Best Time to Go to Morocco – the Weather – Berber Treasures Morocco Tours.